Available at RC Willey, the Montgomery sofa & loveseat living room set are sure to add stylish appeal with timeless versatility to your living spaces. If you're looking for stylish appeal with timeless versatility, look no further than the Montgomery mocha brown sofa—available at RC Willey. With delicately scrolled arms and striking contrast pillows, this collection is an expert fusion of style and comfort with a distinct emphasis on accessibility. If you're looking for stylish appeal with timeless versatility, look no further than the Montgomery mocha brown loveseat—available at RC Willey. With delicately scrolled arms and striking contrast pillows, this collection is an expert fusion of style and comfort with a distinct emphasis on accessibility. Traditional Mocha Brown 2 Piece Living Room Set - Montgomery is rated 4.5 out of 5 by 8. 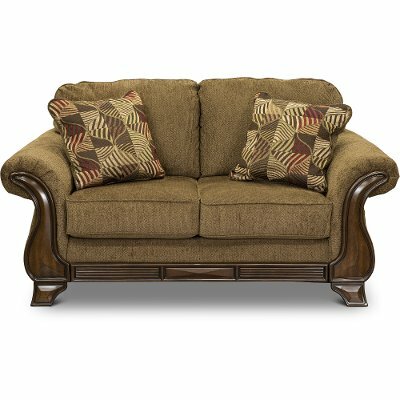 Rated 5 out of 5 by Army Excellent Products I enjoy the look and feel of the sofa and love seat can't believe. how well this set is builded.You can't find a set at this price that is better. Rated 5 out of 5 by Dcross3268 Couch Looks Great, comfortable easy to clean pillows are nice and built strong as well.. Rated 5 out of 5 by ValHan Love it! Montgomery Brand This set has been wonderful! It looks great, is comfortable, and functional. Wouldn't trade it for anything. Rated 5 out of 5 by Mrnmrs Very comfortable For the price, this set is very comfortable and stylish. Rated 5 out of 5 by Nanasdream Firm and comfortable cushions These couches are very comfortable and sturdy. The cushions stay in place and do not move. The woodwork down the sides and legs are really bice. Rated 1 out of 5 by WantBetterQuality Know What You Want This sofa and loveseat are beautiful and stylish. 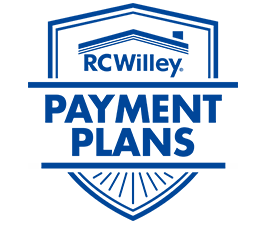 However, the quality of workmanship is poorer to help keep the costs down. It's great to look at, but good looks won't last long with these. Cushions started going flat within a couple of months and now is misshapend. Also they sit pretty low to the ground, making it hard for taller people to get out of their seat. 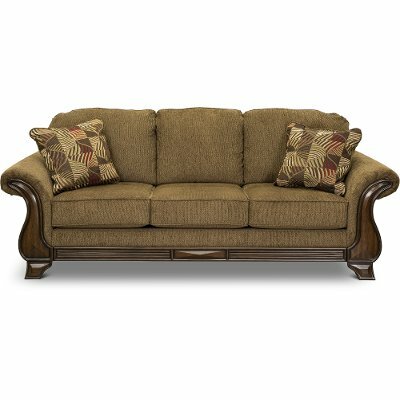 Rated 5 out of 5 by Lovelylady1 I love this furniture I bought this couch set about a year ago. It has been a the best couch I have ever owned. It’s very comfortable perfect size for my house. I love the color scheme. All around great furniture.